Printing lucky money Tet envelopes that look like banknotes is considered a violation of the law, according to the State Bank of Vietnam in HCM City. The State Bank of Vietnam in HCM City has asked the HCM City People's Committee to work together to tighten management over the use of banknotes. Envelopes for lucky money during the Tet Holiday are usually red with zodiac animals. Envelopes come in many shapes and forms and the most recent trend is the envelopes that look exactly like banknotes. Each of the envelopes is sold for VND2,500 to VND3,000 or VND1,000 for wholesale customers. 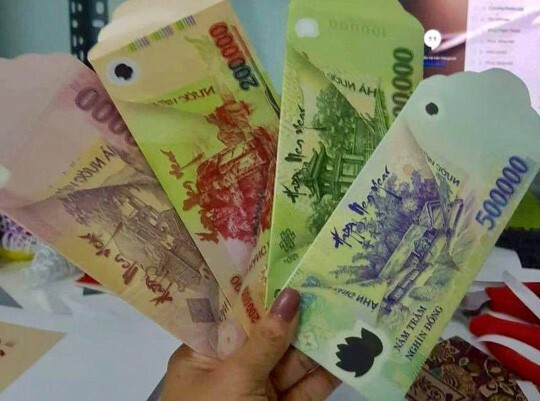 They look like Vietnamese banknotes with denominations of VND100,000, VND200,000 and VND500,000. There are also USD-look-alike envelopes. However, the use and printing of the images of Vietnamese banknotes have not been approved by the SBV. According to the SBV, the use of Vietnamese currency images and the production and sale of lucky money envelopes with the banknotes images without permission must be stopped. Resolution 96 about administrative sanctions in banking and monetary fields state that copying and using a part or all details on the Vietnamese banknotes illegally will be fined from VND40m (USD1,700) to VND80m. Customers are advised against buying banknote-look-alike envelopes, key chains or other products. The SBV has asked for co-operation from the Ministry of Public Security, Ministry of Industry and Trade and the Ministry of Information and Communications. Several printing facilities in HCM City said they had stopped making such envelopes after being inspected and given warnings by the authorities.